We write to urge you to act expeditiously to address appalling levels of violence and extreme violations of civil rights in Honduras. 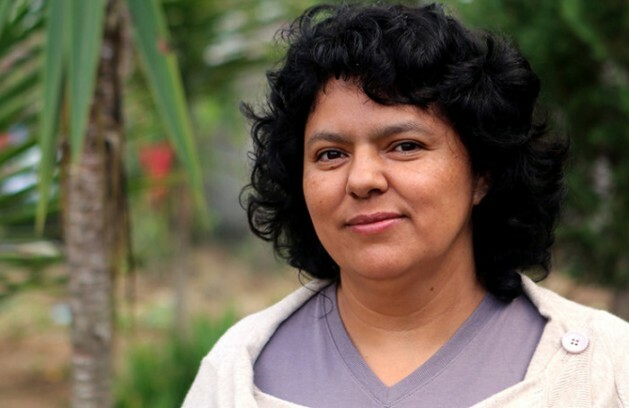 We are profoundly saddened and angered by the brutal assassination of Berta Cáceres, and appalled by our government's continuous assistance to Honduran security forces, so widely documented to be corrupt and dangerous. • Significant pressure on the Honduran government to immediately and permanently stop the Agua Zarca dam, following the request made by Senator Leahy. The murder of Ms. Cáceres, the co-founder and coordinator of COPINH, the Council of Popular and Indigenous Organizations of Honduras, should trigger the strongest possible diplomatic response. She was internationally renowned for her courageous work defending indigenous land rights and opposing environmentally destructive megaprojects. In 2015, she was awarded the prestigious Goldman Environmental Prize. The killing of Ms. Cáceres fits into a broad pattern of attacks against and targeted killings of Honduran activists, and community leaders since 2009, in which state security forces have allegedly been involved. COPINH has been a frequent target. In July 2013, the Honduran armed forces shot and killed Tomás García, a COPINH Lenca community leader, while he was peacefully protesting against the Agua Zarca hydroelectric dam. Amnesty International reports that Cáceres and other COPINH leaders have been subjected to judicial persecution and have faced "unfounded charges in relation to their actions as human rights defenders." In 2013, Cáceres was jailed on a falsified charge of weapons possessions, and only freed thanks to the pressure of Amnesty International and an international outcry. We also note that many other Honduran social activists, members of the political opposition, and human rights defenders have been victims of targeted killings and attacks. According to Global Witness, Honduras was the most dangerous country in the world for environmental activists in 2015. International human rights bodies including Amnesty International, Human Rights Watch, Reporters Without Borders, the United Nations, and the Inter-American Commission on Human Rights have all documented a dramatic increase in targeted killings of journalists, legal professionals, LGBTI activists, land rights activists, labor activists, Afro-Indigenous and Indigenous activists, and other activists in the years since the 2009 military coup. Disregarding her family's request, Ms. Cáceres’ body was subjected to an autopsy by Honduran officials without the presence of an independent forensic expert. Such action underscored the danger of allowing the Honduran government--with its established track record of corruption and subversion of the rule of law, including the destruction of evidence--to proceed further in the investigation without independent international oversight. Honduras and the world have lost an extraordinary advocate for environmental and social justice. We must now do everything in our power to ensure that her tragic assassination will serve as a catalyst for positive change in Honduras, not just empty promises and more of the same. Therefore, we urge you to carefully rethink our country’s close and supportive relationship with the Honduran government. We look forward to your response to our heartfelt concerns about terrible human rights violations in Honduras. Gustavo Castro Soto, Mexican national from Chiapas, and long standing colleague of Berta Cáceres in the Meso-american struggles against megaprojects, is still being held as of Saturday by the Honduran officials. As sole eye witness to the crime, his life is in danger. COPINH leader Aureliano Molina is also being held. The authorities are desperate to blame someone from COPINH or their allies for the death of Berta, concocting ridiculous hypotheses that Berta's assassination was a "robbery" or "crime of passion". Read the action alert from Other Worlds has posted, to call, email or fax the Honduran Ambassador to the U.S. and the US Ambassador to Honduras, for the release and safe return of Gustavo to Mexico.